Lasse Erik Pöysti (24 January 1927 – 5 April 2019)   was a Finnish actor, director, theatre manager and writer. He was born in Sortavala. Matriculation is the formal process of entering a university, or of becoming eligible to enter by fulfilling certain academic requirements such as a matriculation examination. Birgitta Margaretha Ulfsson was a Finnish actress and theater director. She was a versatile actor and a recognized pioneer of avant-garde theater in Finland. The Tampere Workers' Theatre or the TTT-Theatre is one of the two main active theatres in Tampere, Finland, along with the Tampere Theatre. Kari Hotakainen is a Finnish writer. Hotakainen started his writing career as a reporter in Pori. In 1986, he moved to Helsinki. He became a full-time writer in 1996. He has two children with his wife, sound technician Tarja Laaksonen, whom he married in 1983. 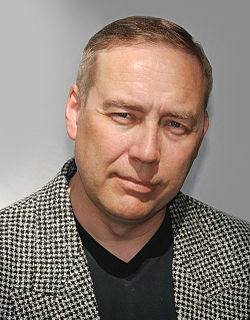 He has also worked as a copywriter and as a columnist for the Helsingin Sanomat. The Finlandia Prize (Finlandia-palkinto) is a literary award in Finland by the Finnish Book Foundation. It is awarded annually to the author of the best novel written by a Finnish citizen, children's book, and non-fiction book. The award sum is 30,000 euros. Works may be in Finnish or Swedish but non-Finnish citizens are not allowed to enter. However, in 2010 the Finnish Book Foundation made an exception for a nominee. Vita lögner is a Swedish soap opera that aired on TV3, (1997–2002). The plot focused on the social life of the hospital staff and families in the fictional town of Strömsvik. Vita lögner was TV3's first big soap opera hit after Kanal5 bought Vänner och fiender from them in 1997. Many big stars in Sweden have done roles in the show, among them Alexander Skarsgård, Petra Hultgren, Anna Järphammar, Maud Adams and Per Moberg. Charlotte Perrelli had a bigger role as Milla Svensson during 1997-1998. It was after Kanal5 bought the rights to Vänner och fiender and TV3 saw what a huge success the show was for the channel that they decided to produce Vita lögner to compete over the same time slot. Helsingin Sanomat, abbreviated HS and colloquially known as Hesari, is the largest subscription newspaper in Finland and the Nordic countries, owned by Sanoma. Except after certain holidays, it is published daily. Its name derives from that of the Finnish capital, Helsinki, where it is published. The Finns Party, formerly known in English as the True Finns, is a Finnish conservative political party, founded in 1995 following the dissolution of the Finnish Rural Party. Kari Sulo Tikka was a Finnish legal scholar. He was a Professor of Finance Law at the University of Helsinki and one of Finland's leading experts on taxation. Sanna-June Hyde born Colchester, England, is a Finnish-English actress at Helsingin kaupungin teatteri, Helsinki City Theatre. She has played in Helsingin Kaupunginteatteri's Hotelli Paradiso, by Georges Feydeau, dir Neil Hardwick, playing Marcelle Paillardin, object of Master Builder Pinglet's desires. She was also in Metsäperkele written and directed by Kari Heiskanen. Metsäperkele is based on the historical figure G.A. Serlachius, a Finnish 19th century industrialist. In 2012 she performed in Yksi mies, kaksi pomoa, the Finnish version of One Man, Two Guvnors by Richard Bean, translator Mikko Koivusalo, direction Neil Hardwick. Pirjo Irene Honkasalo is a Finnish film director who has also worked as a cinematographer, film editor, producer, screenwriter and actress. In 1980 she co-directed Flame Top with Pekka Lehto, with whom she worked earlier and later as well. The film was chosen for the 1981 Cannes Film Festival. In the 1990s she focused on feature documentaries such as "The Trilogy of the Sacred and the Satanic". Honkasalo returned to fiction with Fire-Eater (1998) and Concrete Night (2013), both of which were written by Pirkko Saisio. Concrete Night won six Jussi Awards in 2014, among them the Jussi for the Best Direction and the Jussi for the Best Film. Its world premiere was at the Toronto International Film Festival in Masters series. Johanna Vuoksenmaa is a Finnish television and film director and screenwriter who has also worked as a photographer, installation artist and a teacher. Her films have been shown at numerous film festivals around the world and she has won many Finnish film and television awards for directing and screenwriting. As a director and screenwriter, Vuoksenmaa prefers the comedy genre because to her comedy means relief, forgiveness and defense. She does not use casting agencies but prefers to cast actors to her films herself, since she thinks that it creates a level of trust between the actor and the director. Hobitit is a Finnish live action fantasy television miniseries originally broadcast in 1993 on Yle TV1. Produced by Olof Qvickström, it is based on The Lord of the Rings by J. R. R. Tolkien, but limits itself to the storyline of Frodo and Sam. Their adventures are narrated by Sam many years later to an audience of young Hobbits. Except for a flashback to Bilbo's encounter with Gollum, no material from The Hobbit is used. James Hirvisaari is a Finnish politician. He was elected to the Finnish Parliament in the 2011 general election held on 17 April on the electoral list of the Finns Party, but since 2013 he has represented Change 2011. Vivica Aina Fanny Bandler was a Finnish theatre director and agronomist. She founded a theatre in Helsinki and is credited for popularizing avant-garde Finnish theatre. Eeva-Kaarina Volanen was a Finnish actor. She worked at the Finnish National Theatre for 45 years (1945–1990). Her husband was professor Sakari Puurunen. They had no children. Laura Kaarina Räty is a Finnish politician, former Minister of Social Affairs and Health and a business director at the Finnish private hospital corporate group Terveystalo. Pertti Kurikan Nimipäivät were a Finnish punk rock band, formed in 2009 in a charity workshop for adults with developmental disabilities. They are the main focus of the Finnish documentary film The Punk Syndrome. In 2015, they qualified for the finals of Uuden Musiikin Kilpailu, which they later won; they represented Finland in the Eurovision Song Contest 2015 but got knocked out in the semi-final. The band disbanded in December 2016 when guitarist Pertti Kurikka turned 60 years old and retired from playing punk rock. Eero "Käkä" Milonoff is a Finnish actor. He graduated from the Helsinki Theatre Academy in 2005, and he works as a freelance actor. In 2008, he was nominated for the Jussi Award for Best Actor for his role in the biopic Ganes (2007) as the drummer and vocalist Remu Aaltonen of the rock band Hurriganes. Laura Pauliina Malmivaara is a Finnish actress. Her acting career began in 1993, and includes dozens of roles in film and television productions, as well as stage appearances. In addition to acting, she has also worked as a singer, photographer, television host, blogger, and model. The 2017 Finns Party leadership election was held in Jyväskylä, Finland, on June 10, 2017, to elect the new chair of the Finns Party. All members of the party who had paid their subscription were allowed to vote in the election. The Local Band is Finnish hard rock supergroup formed in 2013. The band got its start when Children of Bodom's Alexi Laiho and The 69 Eyes' Jussi 69 expressed interest in playing some of their favorite songs together. Jussi 69 then asked Reckless Love frontman Olli Herman to join, and the initial line-up was rounded out by Santa Cruz's Archie Cruz. Dubbed "The Local Band", the group played their first show on December 27, 2013 at the Tavastia Club in Helsinki, Finland, which was sold-out. The band then played at the Ruisrock festival in Turku, Finland in July 2014. The group initially intended to play only once a year. Pauliina May is a Finnish-Dutch vocalist and a vocal pedagogue. She is currently resident in Kinderdijk, The Netherlands. ↑ Petäjä, Jukka. "Näyttelijä ja ohjaaja Lasse Pöysti on kuollut" (in Finnish). Helsingin Sanomat. Retrieved 5 April 2019. ↑ Sibelius Piano Quintets and Melodramas. Booklet, page 8. BIS-CD-1412 2007, BIS Records AB, Åkersberga.